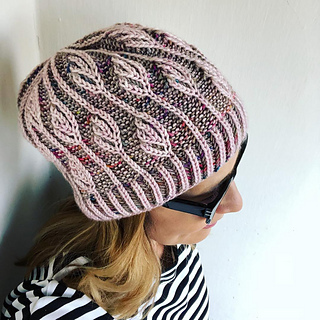 Last time it was great fun to combine brioche with garter stitches for my Berrit hat pattern! That’s why I was trying to add some leaves this time and it was definitely worth trying ! There aren’t many green things in my wardrobe, but this kind of green, called Joshua Tree by Madelinetosh, is matching even to light blue! I am more than happy how it worked out! The pattern is working with a warm rose and a speckled beige as well, it is easily to remember and suitable for brioche newbies too! 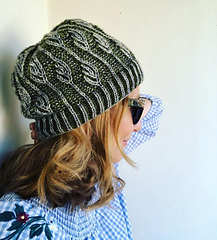 The hat has a brim, is very stretchy, slouchy and well-fitting at the same time. It’s important to note that there is no 4-stitch-decrease to be knit. You can do it, knitters! Shown green version was knit in Madelinetosh Tosh DK in Pelican (MC) with Joshua Tree (CC). Shown rose version was knit in Madelinetosh Tosh DK in Rose (MC) with Hedgehogfibres Merino DK in Artifact (CC). Size 4 US / 3,5mm 16” / 40cm circular and dpns or long circular for preferred method of working small circumferences in the rnd.